This past weekend I had the opportunity to see both shows as part of my anniversary present from Ed. Never has my reaction to back-to-back shows been so dramatically different.The shows were chosen by Ed. Ghost for it’s part in our first dust-up as a married couple. Spiderman because Ed is a Marvel and DC geek and we had heard that it had been retooled and was much better. When I see a Broadway Musical I am not expecting a deep, thought provoking message or revelation. I am expecting to entertained and walk away with a song in my heart (or at least the head). Neither of these show attempted to be shows like Les Mis, Rent or Chess. Both were billed as fun entertainment. In judging a show I look to Story, Songs, Cast and Crew. My picture of the Theater housing Ghost. Ghost. The Story of Ghost is well known to most. (Except to me as one of the dozen people who had not seen the movie). Sam is shot and killed and then tries to save Molly from harm from the killer. The sub plot involves the work “ditto”. Simple, Straight forward, and easy to follow. Spiderman. The Story of Spiderman was more convoluted. The play started out with a scene or two about the mythos of spiders and a lesson in entomology partially set to music. The story then changed to Peter Parker being bullied, becoming Spiderman getting revenge on bullies then losing uncle and getting an arch enemy and a girl. It was difficult at best to follow the story since the sub plots would bounce around and be interrupted by songs that did not fit the scene or add to the story. That brings me to Songs. Spiderman. The songs in Spiderman were written for the most part by Bono. To be fair, Bono has had some hits and a few good “story-based” songs (Sunday, Bloody Sunday or Still Haven’t Found What I Was Looking For). It is clear, as a Broadway writer, Broadway hasn’t found what it’s looking for. The songs added little to move the story and in fact after they were over, I was left wondering, What? A chorus sang the first song about Arachnophobia. It sounded muffled and with no clear lead, only about every other word was clear. The music did nothing to move the shown and basically served as a distraction from the bad writing and acting. Ghost. The music in Ghost actually worked. It moved the story and in many cases was able to set a mood and provoke strong emotions. Songs like Are You A Believer?, I’m Outta Here, Focus, and Sam’s version of Unchained Melody lightened the mood. Here Right Row, More, and Suspend My Disbelief were upbeat and added to the story. And of course there were songs that opened the buckets of tears throughout the audience. If you have ever lost a partner, the song “With You” will open wounds thought to be long closed. The hurt and pain came through loud and actually almost to clear, for me. This is the part that Ghost really differs itself from Spiderman. 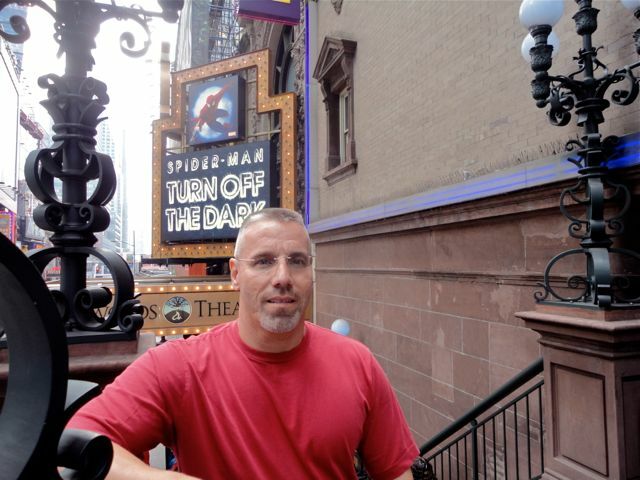 SPIDER-MAN on Broadway – Video – Official Site. If the producers of Spiderman were aiming for a Peter Parker in the throes of adolescence half child half man they sort of succeeded. When Reeve Carney sang it sounded like a teen whose voice was in the midst of changing. Struggling to reach notes sometimes soft sometimes loud. 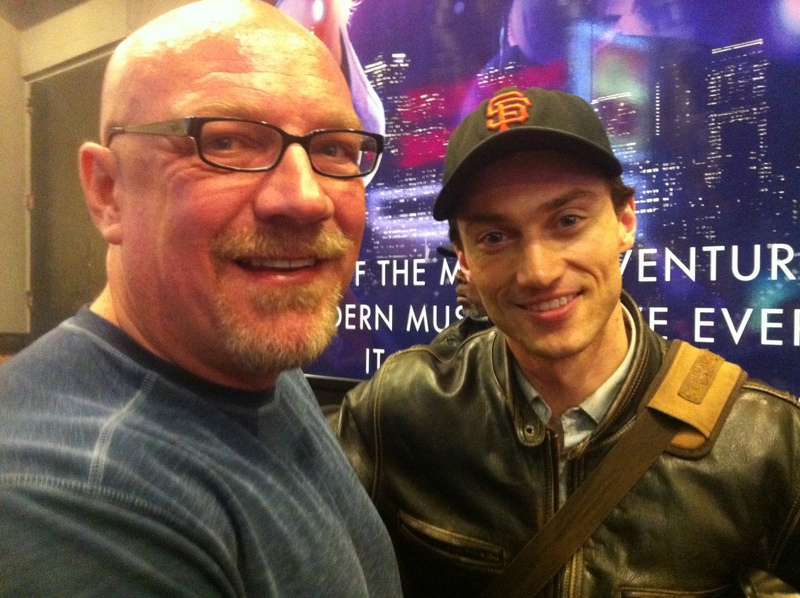 Patrick Page as Osborn could not make up his mind as to whether he was going to over act Mike Meyers Dr. Evil or Fredric March’s Dr. Jekyll. In what should have been a misty eye emotional scene, as Osborne realizes his wife is dead, he lets loose with a howl that elicited laughs from the audience. The rest of the cast was stiff and uncertain. There was no chemistry between the characters with the exception of Parker and the Bullies who had every reason to make fun of Parker. This was a sharp contrast between Spiderman and Ghost. 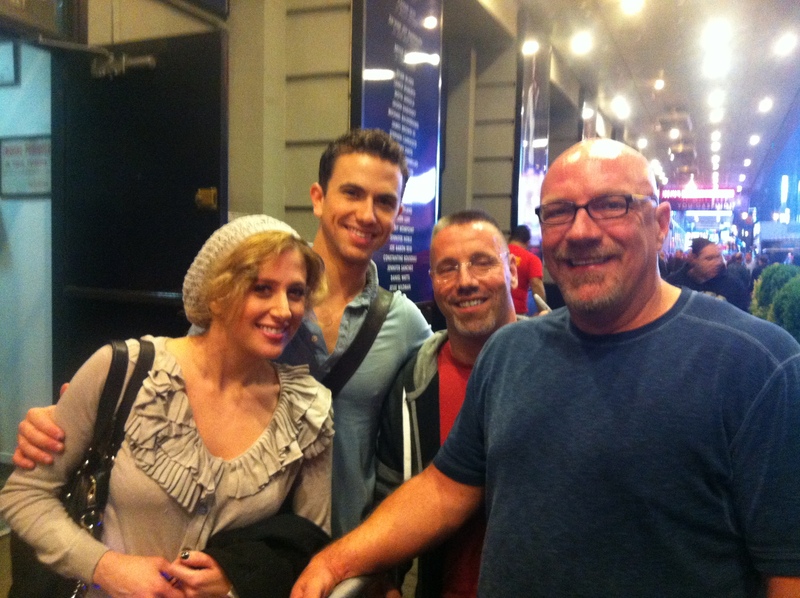 You could feel the chemistry between Sam (Richard Fleeshman) and Molly (Caissie Levy) in every corner of the Theater. Of course they were also the leads that opened the show in London and Manchester before that. There was never any doubt that it was a love story between these two. From their bio’s it was clear that these two were the best available. 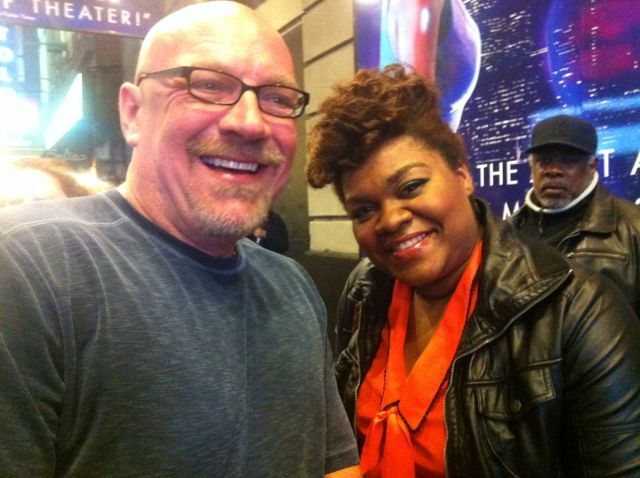 Da’Vine Joy Randolph proved to be a more believable Oda Mae Brown than Whoppie Goldberg. Her presence and costumes help to give her a stage presence worthy of a Tony nomination. Bryce Pinkham played a truly convincing villain. During curtain call there was a strong urge to boo him as a Snidely Whiplash villain instead of cheering a actor who succeeded in creating an illusion. By crew I mean the technical aspect of the show. Again Spiderman comes up as shoddy and not worthy of a high school production in Paramus, New Jersey. The set was as cheep as a high school reusing boards used in very show for the past decade. Nothing was solid. As to the special effect that are wowing the B&T crowd that are the mainstay of the show they fell flat. How special is the flying Spiderman being held up by 6 distracting cables? The costumes varied from the regular cast and the Alice in Wonderland characters in stylized clothes and big head masks. All incredibly distracting. The lighting was more appropriate to a concert production with lots of flashing lights and other tricks to distract from an otherwise flat show. On the other side of the spectrum is Ghost. From the moment of Sam’s death where he moves out of his fallen body on stage left to stage right in one seamless move I was left trying to figure out how they did it! It got so bad that I actually lost my place in the show because I was so fixated on trying to figure out the tricks, I would almost miss the next one. It is easy to go through a wall in a movie where film (or now computer animations) can be manipulated. It is impossible to do in live with out it looking fake. Well the crew of Ghost did it; flawless and with ease. My best guess was the use of holograms. Even then I could not be sure what was real and what was a hologram. I will see the show again just to watch the effects. The weekend will be remembered as a weekend of extremes. On one side, probably the worst show I’ve ever seen, including Toni Tennille in Victor Victoria. On the other side, Ghost and one of the most entertaining nights I’ve had in a theater. As I said, I will see Ghost again. I hope you get a chance to see it with this cast.